We're less than a month away from the premier supply chain event of the year: ISM2016! This year's agenda is loaded with educational and networking sessions designed to provide attendees with career development tips, strategic sourcing and procurement best practices, and lessons learned. 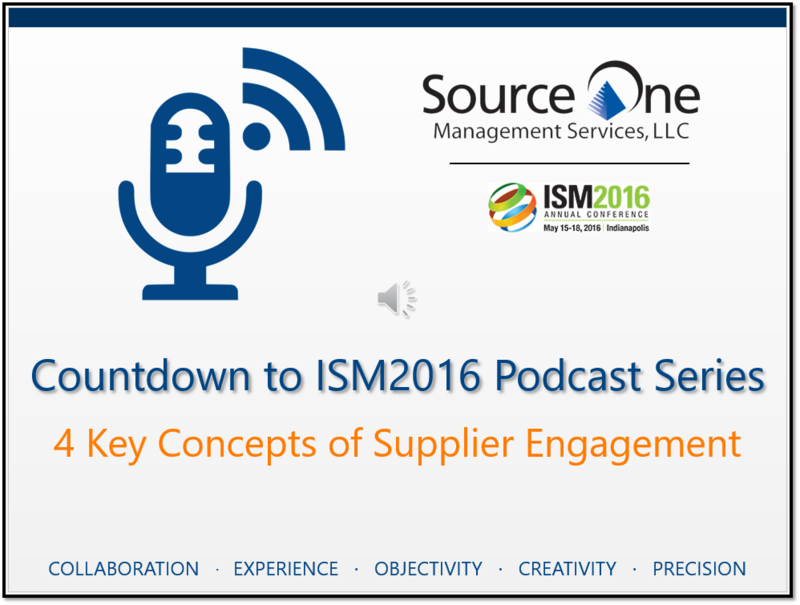 In continuing our Countdown to ISM2016 Podcast Series we're sharing best practices for supplier relationships: Keys to Solid Supplier Engagement. 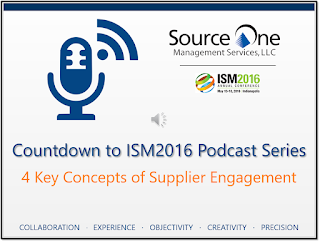 This week Source One's Associate Director Jennifer Ulrich shares how to engage suppliers from the start of a sourcing engagement and throughout the life cycle of the relationship. Ulrich explain how to leverage initiation, collaboration, communication, and sustentation for a setting up supplier relationships for success. These four concepts are a critical foundation for Supplier Relationship Management - a topic of discussion during ISM's Exec IN forum - sponsored by Source One Management Services. The exclusive event, designed for forward-thinking executives of industry leading organizations, will explore a number of challenges unique to companies with large-scale supply chain operations. Adding to the Exec IN discussions are keynote speakers Alan Mulally, former CEO of Ford Motor Company and Susan Cain, author of the best selling book, Quiet: The Power of Introverts in World that Can't Stop Talking. Both will provide insights into the people and processes best practices necessary for a competitive advantage in today's increasingly demanding landscape.